Beer Advocate is craft beer's most widely-read magazine, providing insights for consumers and producers alike. And recently, we've collaborated on a number of issues. GBH photography has helped bring topics to life, like brewery safety, and the Goose Island Clybourn brewpub's real estate challenges — fingers crossed on that one still! But even more importantly, I've been able to help draw attention to some of the most deserving players in craft beer in three of the last nine Beer Advocate cover stories. 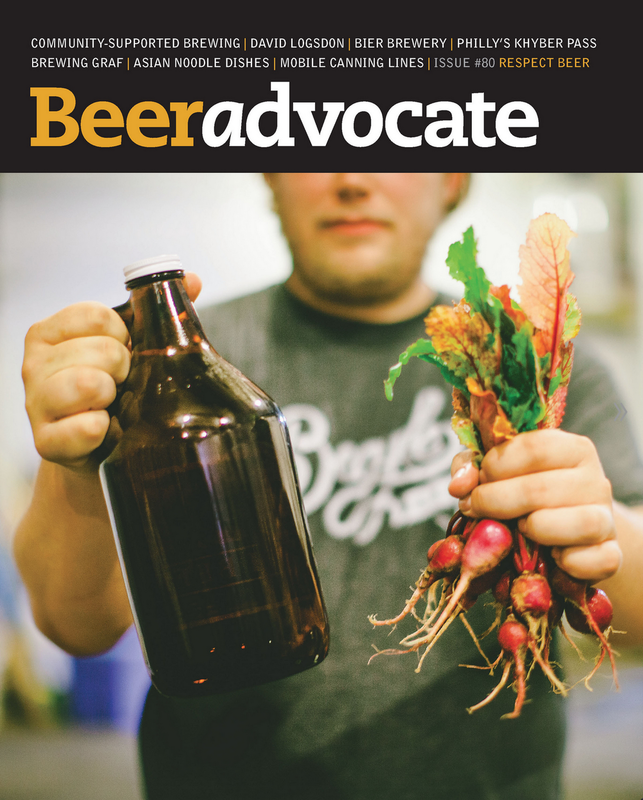 The most recent cover featured Begyle Brewing's Kevin Cary, who's Community Supported Agriculture (CSA) business model highlights the growing relationship between small breweries and their neighborhoods. While Begyle gets its start, and expands this month with a new brewhouse, they're serving as the neighborhood's hub for CSA farms. While I visited that day, neighbors stopped in to grab their weekly harvest from the beer cooler, including cucumbers, tomatoes, and the radishes pictured on the cover. Soon, neighbors will be able to get a growler to go with those veggies! This cover features Revolution Brewing's brewer, Matty Kemp. The issue covered the topic of brewery tours, and how so many breweries are starting to offer more personal, in-depth experiences beyond pointing at mash tuns, and letting you smell the hops. This shot was from a bachelor party with a close friend of mine, where Matty served as our guide into the barrel cellar. I caught him just as he pointed to the ceiling, as if to heaven, like Socrates from an old Renaissance painting. That epic, godly beard helped complete the picture, and the clipboards on the door hung like old scrolls. Solemn Oath Brewery was featured for this issue, highlighting the Class of 2012 breweries from around the country. Brothers John and Joe Barley, alongside brewer and renaissance man, Paul Schneider, stood atop the brewhouse as they greeted their guests on their first-ever Oath Day. The fresh faces, and fresh beers from Naperville started dominating tap handles all over Chicagoland.